A week ago, I have purchased another system as we got a small project to work on. It is an online project and both systems need to have Internet. We have Sify connection at home and now we have to share it in both systems. I never tried before connecting two systems or sharing an internet connection. I have digged the net and found that we can share the internet using router. Router is a bit expensive one, so further digged the net for a simple workaround to connect both computers and share a single internet connection. I found that using LAN card and crossover cable, we can setup a LAN connection and share the internet connection. Everything I did, but network icon in system tray was showing limited or no connection. For another one hour, I tried all sort of things, but failed. I put the same IPs in both systems, it did not connect. Then, I selected the option of obtaining IP automatically, again failed. Everyone one the net was describing about connecting it step-by-step, but no one explained about IPs. At last, I searched for it on Microsoft website and in an article, I found the IP numbers to put in, which are the default when you connect in LAN. 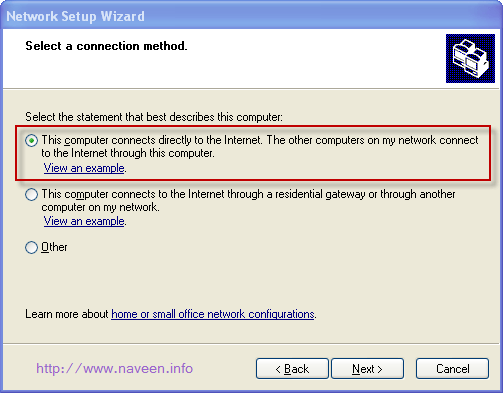 Following is a step-by-step instruction to connect two systems and share the internet connection. Things you need: LAN Card and crossover cable. 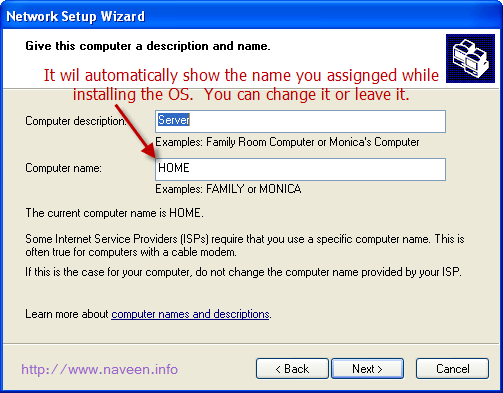 Install LAN card in one of two systems, which will act as a Host. You need to connect to the internet through this computer. Connect one of two pins to the Host system and another pin to the second system. Once you connect both through cable, you can see the network icons glowing in your system tray. Sometimes, it may show the message that it is acquiring the IP address. 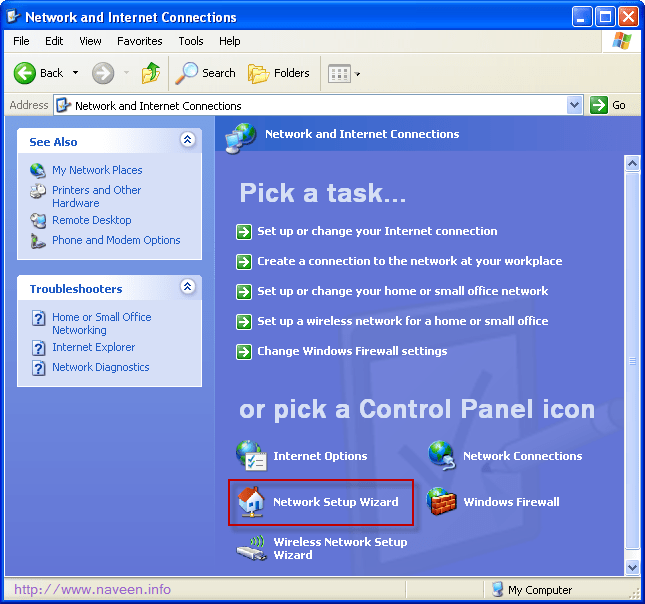 Now, go to the Control Panel>Network and Internet Connection>Network Setup Wizard in Host system, in which you have installed an extra LAN card.Â Look at the screenshot on the right side. It will show a popup. Click two times and follow the below screenshots.Â Click on the images for a bigger and clear images. 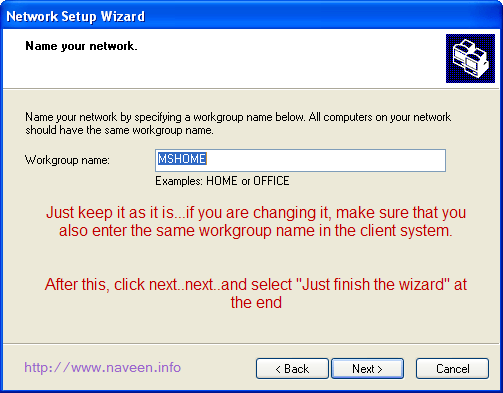 In the Client system, run the same network setup wizard, but this time select the connection method as second one, look at the image below. Rest of the process is same. Now, in the Host system, you will be entering the IP address provided by the Internet provider. 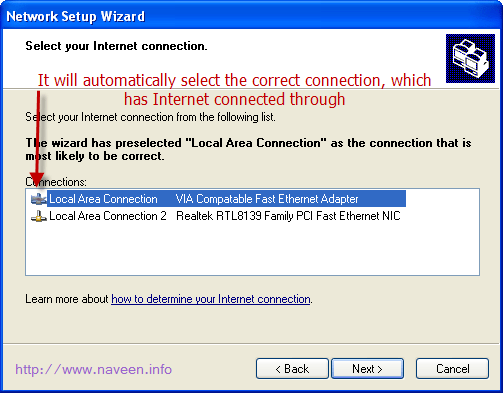 In the Client system, enter the below IP details and click ok. Now, you will see a popup from the second connection telling that it is now connected at 10 mbps speed. Now when you connect the Host system to internet, you can access it from the Client system too. 1. Any type of Internet connection works. 1. You can only connect two systems. 2. Host always to be on to access net on the Client system. If you still have problem, post in comments and I will try to answer. Where you are stuck? It is working fine for us. We are browsing net on both systems without any difficulty. I did the same but my ISP provider gives me this IP 222.205.52.3. when I did that my IP address changed to 192.168.0.1 and I loose my connection in host. When I changed back, I can.t connect on client. I changed the IP of the client to 222.205.52.4 but also was not useful. I appreciate so much your guidance. Oh! You missed something. You will not touch the Host system. Just enter those details as seen on screenshot in Client system only. You just need to enter the DNS sever names same as in Host. i need to connect it to the laptop from my desktop but the laptop will have only one port for the cross cable to be connected. so can u give me a solution for it? Never tried this, but I think you can add an external USB Lan Card and do the same. you can add an extra nic card in the dextop. my ip address is dhcp for getting internet..so what ip should i give in the host pc. and what dns dhould i give in the client pc. the process which you showed is the only process for ICS or any other also along with that… ??? can i apply this process from idea netsetter card? It is the only process. USB data cards will not work for internet sharing. The connection will get disconnected. can i share netshetter’s internet with other computer? Sorry…I never tried that. Do it and post the result in comments.